The R-120 from HKD Blue is the new solution for short to mid-range dust control with low flow rates. This model is designed for interior dust control, specifically for indoor material handling and storage facilities. The R-120 projects a fog-like atomized mist to control dust emissions without saturating material. The 10HP fan motor is equipped with variable frequency drive, allowing the operator to increase or decrease the mist projection from 20ft to 150ft. The 2HP vertical pump supplies pressurized water to the two misting rings. The two rings, actuated either manually or automatically, allow for three different flow rates. 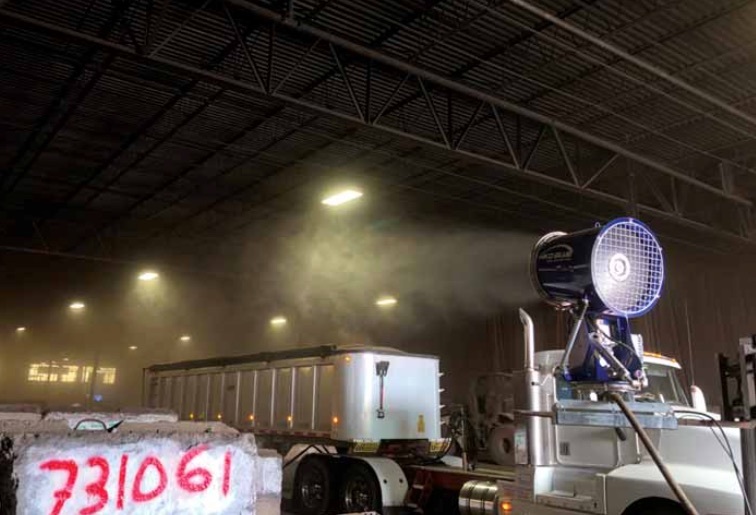 Interior dust control is becoming more important at bulk transfer and storage stations as local authorities begin to enforce strict air quality control regulations. At the Port of Chicago, in the USA, stevedore operators are required to have dust control while loading trucks with manganese ore. Safely handling this type of material requires effective dust control without over-saturation. The R-120 has forklift channels, allowing the operator to easily manoeuvre the machine to spray mist across the trailer, ensuring the material does not get wet. The addition of the R-120 complements HKD Blue’s V-500 product line, which has many proven applications at port facilities. Recently, a self-contained V-500 GT was used at the Port of Providence to control smoke emissions. At this facility, torchers burn and cut railcars and steel I-beams to prepare them for further processing. During this activity, sizeable quantities of dark smoke — unburnt carbon particles — are released into the atmosphere. To avoid complaints from neighbours and environmental violation fines, and to protect workers, the port used an HKD Blue V-500 GT to capture the carbon smoke. The operator programmed the oscillation pattern to create a ‘wall of water’ downwind of the smoke, trapping the unburnt carbon particles and dropping them to the ground. With remote control functionality, operators easily adjust the barrel angle to target the smoke when the wind shifts. They could also increase or decrease the water usage depending on the quantity of smoke emissions to best control the fugitive smoke. The onboard generator of the unit is very important for the operation, as many facilities cannot afford to run 480V power lines because they are costly to install and pose a safety hazard with the high volume of heavy equipment in operation. HKD R-120 Controlling Manganese Dust from HKD Blue on Vimeo.